Monnet Group shares a deep conviction and confidence in India's athletes and sportsmen. Together with the people of India, MIEL pledged its wholehearted support to the Indian sportsmen as they prepared for the ultimate test of performance and human endurance at the London Olympics. Monnet Go for Gold, the campaign was an ode to the sportsmen as they aspired to outshine and establish an even stronger presence for India, striving to carve out an even bigger name for the nation and better their own mark in the greatest sporting event of all times. The Monnet Go for Gold - A run from Kashmir to Kanyakumari, announced in January 2012, saluted the spirit of sportsmanship in India and was a noble cause aimed at creating awareness amongst the people of India towards the efforts of its athletes (representing India at Olympics) to put the country on the global map for sports. It was a journey that aimed to touch the soul of every Indian covering over 50 cities & 6486 kms, to unite them and pledge their support to the athletes, to cheer them, motivate them and send a strong message that the entire nation is behind them. Having commenced its journey from Jammu & Kashmir, the Monnet Go for Gold convoy travelled through Pathankot, Jalandhar, Ludhiana, Chandigarh, Kurukshetra, Panipat, New Delhi, Vrindavan, Agra, Kanpur,Allahabad, Varanasi, Bodhgaya, Dhanbad, Durgapur, Kolkata, Kharagpur, Baleshwar, Panikoili, Cuttack, Bhubaneshwar, Angul, Sambalpur, Katapali, Raipur, Durg, Bhandara, Nagpur, Amrawati, Akola, Jalgaon, Dhule, Malegaon, Nashik, Kalyan, Mumbai, Panvel, Mahabaleshwar, Chiplun, Panhala, Panaji, Marmagao, Karwar, Bhatkal, Mangaluru, Bengaluru, Kannur, Kozhikode, Kochi, Kollam, Thiruvananthapuram, Nagercoil and finally culminated in Kanyakumari. 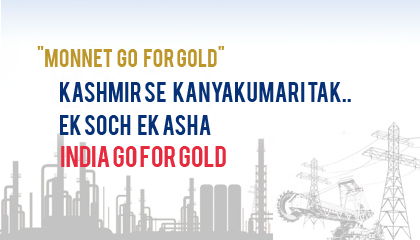 The Monnet Go for Gold Convoy had major stopovers in Jammu & Kashmir, Chandigarh, New Delhi, Kolkata, Bhubaneshwar, Raipur, Nagpur, Mumbai, Bengaluru and Kanyakumari. The convoy met with stupendous response and garnered overwhelming support from the people, who came forward in huge numbers to wish good luck and reiterate their dedication and support for the Indian Contingent for the Olympics 2012. 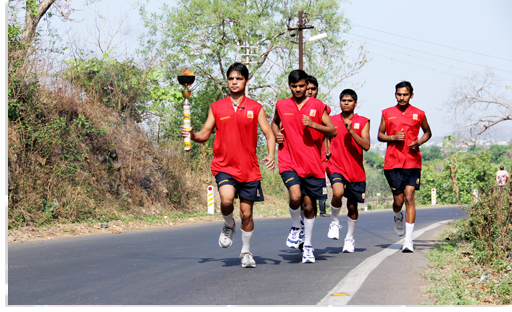 The rally across various cities saw various local athletes participate in this impressive journey of inspiration.